« British columnist agonizes over mixed-race baby. Over half of all homicides in the United States committed by blacks says United States Department of Justice. Note, in the follow DOJ statistics, there is no Hispanic offender category. In all of the graphs and data, the category “white” includes Hispanics as well as those of North African, Middle Eastern, and Central Asian background. 52.2% of all homicides in the United States committed between 1976-2005 were by black offenders. Whites, Hispanics, Asians, and American Indians put together accounted for the other 47.8%. Blacks accounted for a staggering 59.3% of all felony murders. Black are significantly less likely to receive the death penalty than other races for committing murder. In 2005, black made up 42.2% of people under a sentence of death. Since blacks committed 59.3% of felony murders between 1976 and 2005, blacks are far less likely to receive a sentence of death for committing felony murder. 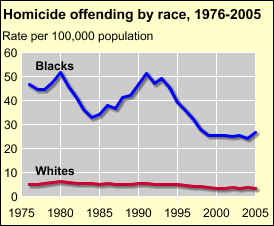 People under the category “white” committed 39.1% of felony murders between 1976 and 2005, but make up 55.5% of people under a sentence of death in 2005. This entry was posted on Thursday, July 12th, 2007 at 4:06 pm and is filed under Uncategorized. You can follow any responses to this entry through the RSS 2.0 feed. Responses are currently closed, but you can trackback from your own site.